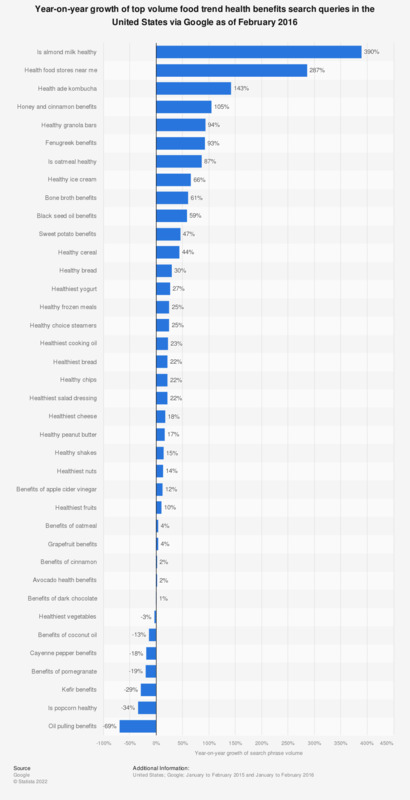 This statistic shows the year-on-year growth of the top volume U.S. food trend health benefits search queries on Google as of February 2016. During the measured period, the search query "fenugreek benefits" increased by 93 percent in over-year search volume. The fastest-growing food trends health benefits search query was "is almond milk healthy" with a 390 percent year-on-year growth in volume. Which do you think is the healthiest option?